Class III Milk and Component Prices for February, 2012 were released on Friday, March 2. Everything was down from the prior month. Class III milk was $16.08/cwt, below the break even for many dairy operations. To put the drops in perspective, below is the data on the key elements. Milk protein had the smallest dip, only 3%. 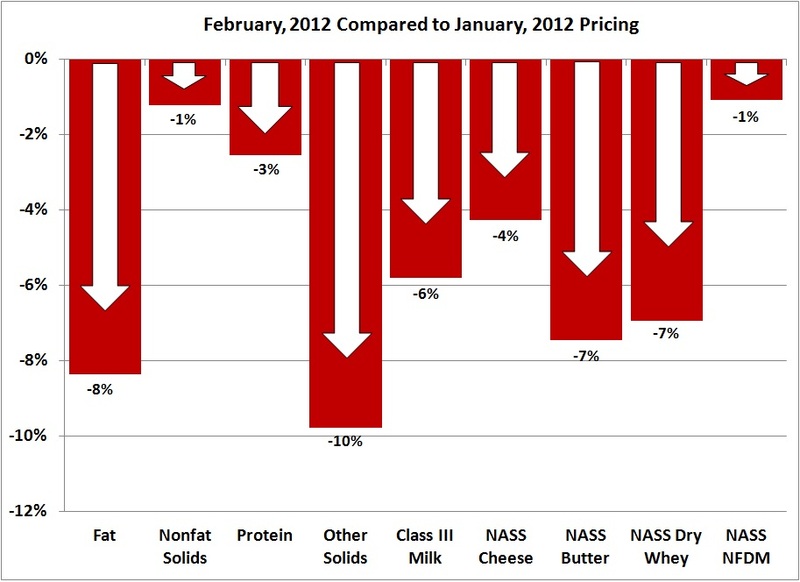 Remember that the price of protein is aided by a lower butter price and butter fell 7%. See the January 3, 2012 post to this blog for an explanation of this relationship. 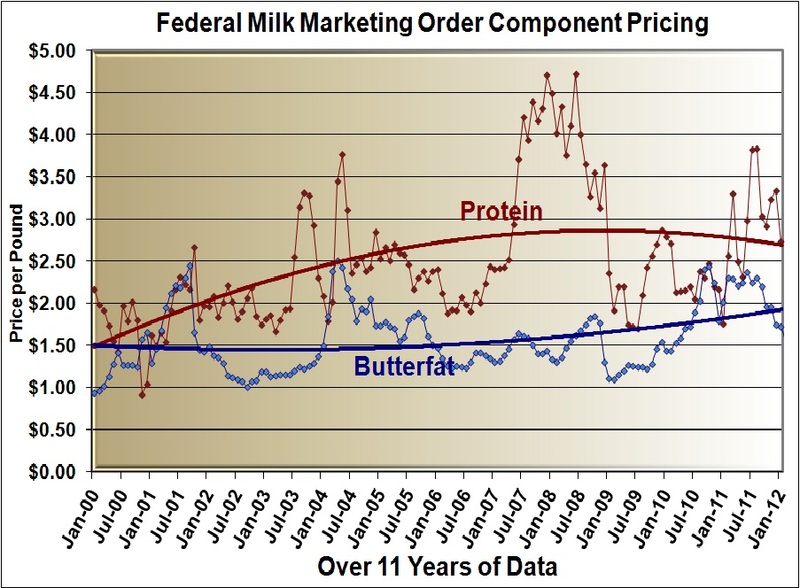 Milk protein was actually right on the 12 year trend line. 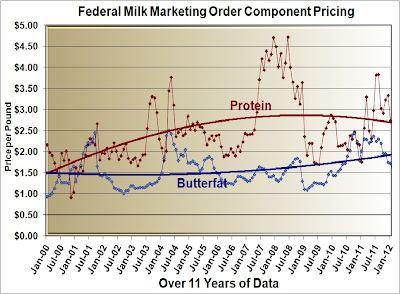 Milk fat continued it's move to the long term levels of $1.50/lb. The value of "other solids" which are based on the dry whey prices, took a big tumble, down 10% to $.45/lb. 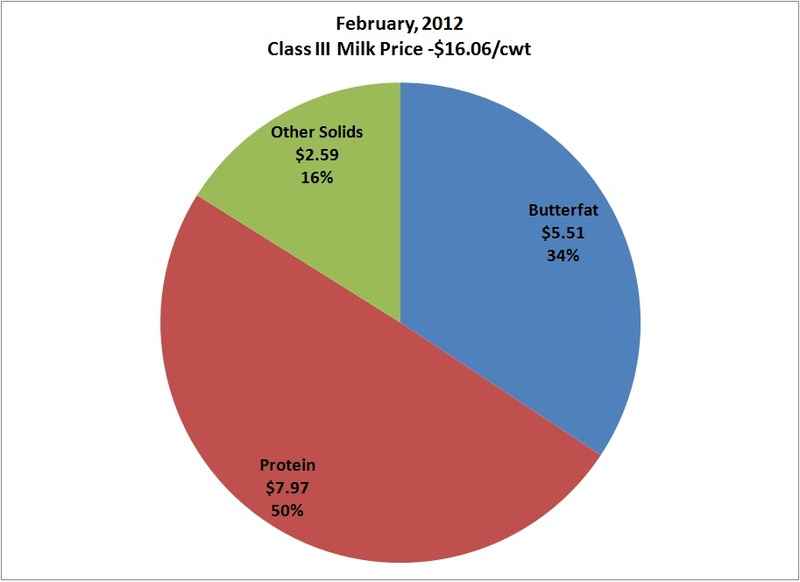 The pie chart of the milk check is typical, with 50% of the income coming from protein. High milk protein production continues to the most significant money maker for dairy producers. Cheese prices took a dive in February. 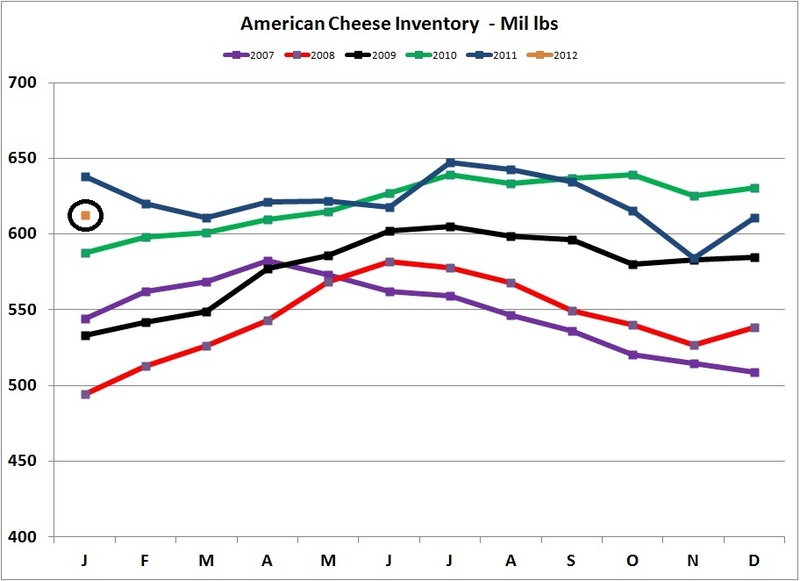 Cheese prices are the main contributor to milk protein prices and Class III milk prices, From the highs of a few months ago to the current value of $1.54/lb, cheese prices have dropped by $.60/lb. or 28%. While $1.54/lb is far below the highs, it is also well above the lows experienced in the last decade. 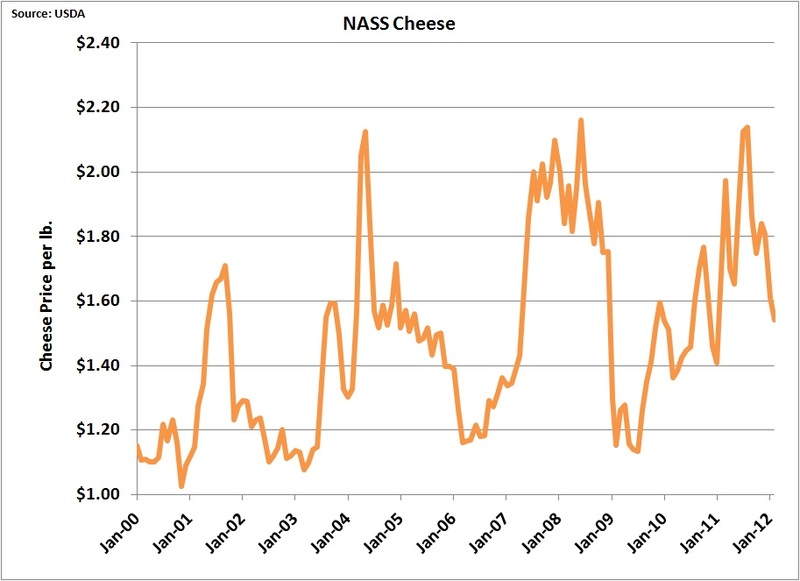 An examination of the factors behind cheese pricing, shows nothing that is alarming. 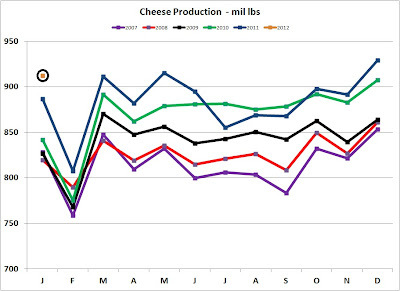 Cheese production continues to grow over time to match the growth in domestic consumption and exports. The January, 2012 production levels are not out of line. No data is yet available for February, 2012 production. January points are circled to help identify them. 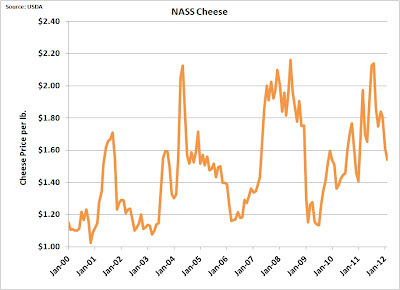 American cheese and natural cheese inventories are not out of line and are actually below the levels for most of 2011. 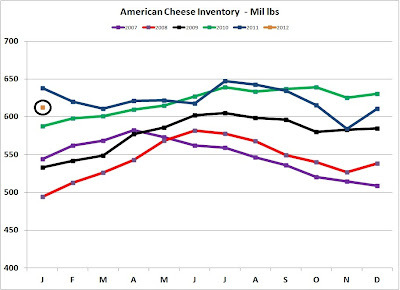 There is no argument for excess inventories taking a toll on cheese pricing. 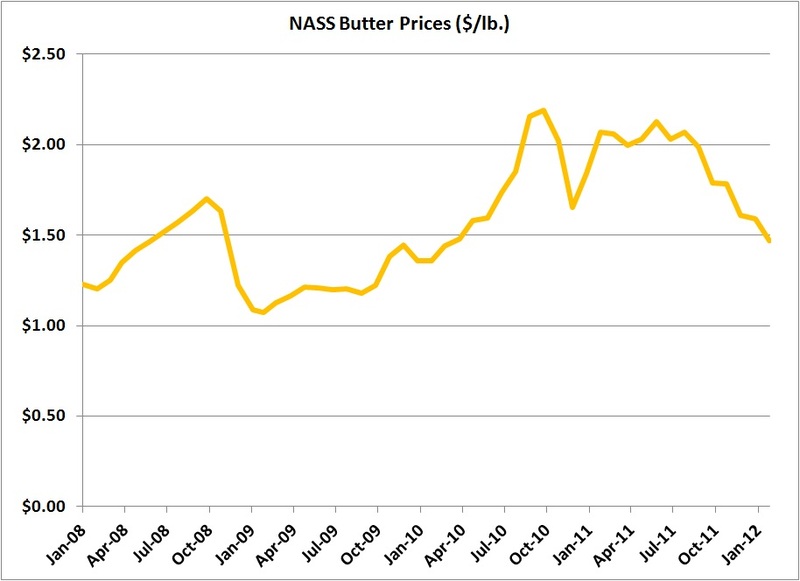 Butter pricing has taken a path similar to cheese, with continuing drops in late 2011 and early 2012. The drops from the June, 2011 high of $2.13/lb to the current $1.47 represent a $.63 decline of 30%. Here, there is logic for the drop in price. Butter production has been accelerating in 2011 and that has continued in January, 2012. This was necessary to bring the butter inventories back to a reasonable level. 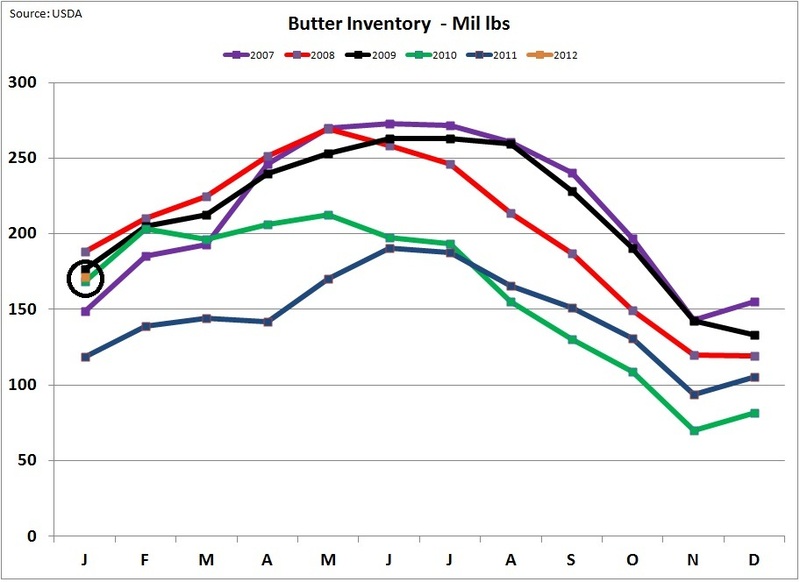 Butter inventories were very low in 2011 as exports increased demand. 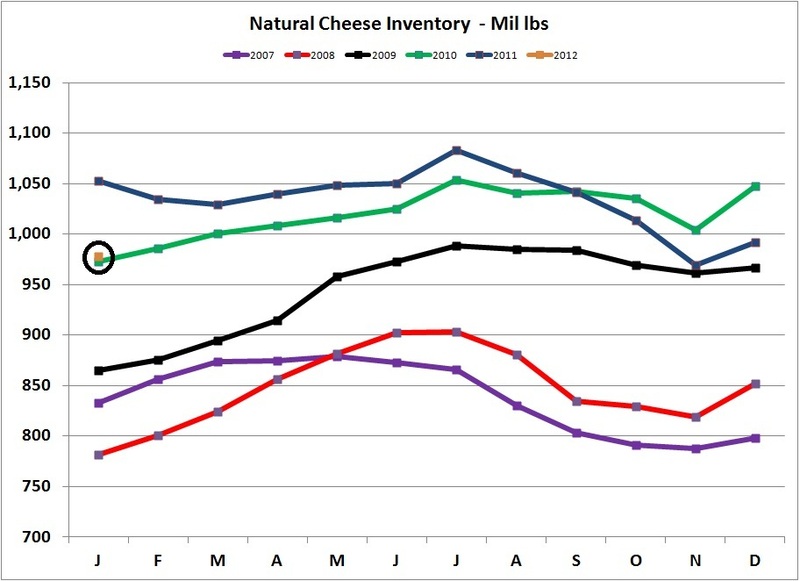 With the 2011 increase in production, inventories have come back to more normal levels. 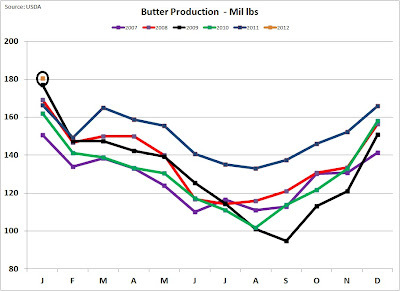 The drop in butter exports experienced in 2011 have also contributed to a recovery in butter stocks. 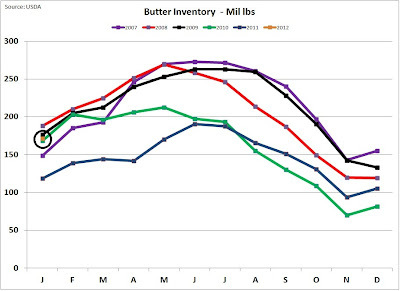 The more normal inventory levels are bringing butter prices back to historic values. 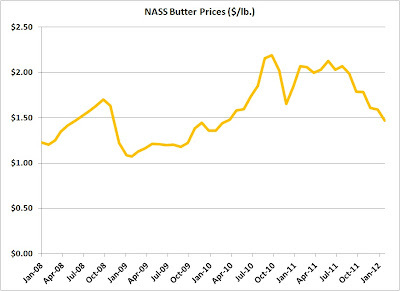 We can expect to see a continuing softening in butter prices. The most important element in milk pricing is the value of cheese. Cheese fundamentals are not in bad shape. As discussed in the last post to this blog, there is an expectation of lower cheese exports in 2012, somewhat the reslut of a strong dollar. In 2011 we exported nearly 5% of our cheese production. A drop of 1% or 2% to an export level of 4% or even 3% can quickly build inventories. 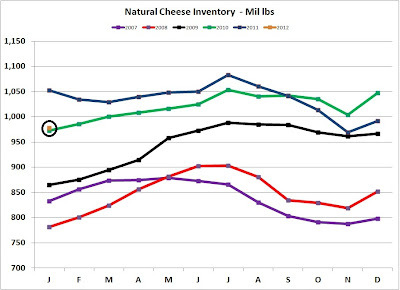 We typically carry a 4 & 1/2 week supply of natural cheese, and a 2% drop in exports for six months can add another 1/2 week to inventory levels. The financial health of the dairy industry rests heavily on cheese exports. All efforts to keep these exports healthy are critical. How can a dairyman contribute? Two ways are to produce higher protein levels needed for cheese manufacturing and to manage a lower somatic cell count that contributes to cheese manufacturing as well as the marketing of U.S. cheese in the global market. Certainly many international factors are not in the control of a dairyman, but managing what can be managed is always the best strategy.